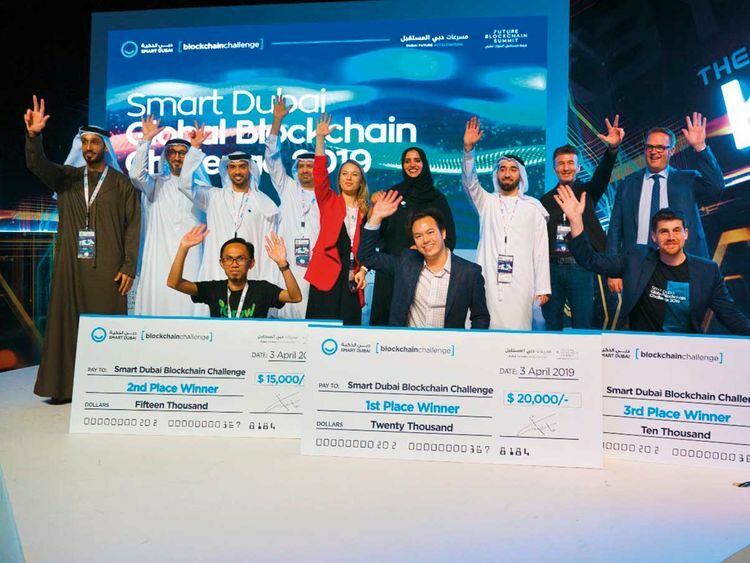 Dubai: Three start-ups from the US, Indonesia and Canada clinched the top three spots in the Global Blockchain Challenge and brought home a total of $45,000 (Dh165,150) cash prize. Quantstamp, Igrowchain and Grayblock won first, second and third places, respectively during the third edition of the Blockchain challenge, part of the Future Blockchain Summit 2019, which drew to a close on Tuesday, April 2, at the Dubai World Trade Centre. Organised by Smart Dubai in collaboration with the Dubai Future Accelerators (DFA), the challenge featured projects that covered 20 different sectors including real estate, asset management, payments, energy, education, health care, and supply chain management, among others. Under the umbrella of the Dubai Blockchain Strategy, the challenge aims to promote innovative applications of Blockchain technology across various sectors. It seeks to transform the Dubai Government into the first administration in the world to conduct 100 per cent of applicable transactions using an encrypted database by 2020. Dr Aisha Bint Butti Bin Bishr, Smart Dubai’s Director-General, said the Global Blockchain Challenge has seen remarkable improvement in the quality and creativity of the submitted projects, which, coupled with the surge in the overall number of applications, clearly underlines its global appeal, as well as the increased appetite for Blockchain technology as a whole. “Our wise leadership in Dubai have realised early on the need to having a futuristic mindset that will take us into the future. While enormous, this task is achievable through determination, and clarity of vision,” Belhoul added. The Dubai Blockchain Strategy revolves around three main pillars: increasing government efficiency by transferring all applicable government transactions to the Blockchain network; creating a blockchain industry and ecosystem; and finally, leading the thinking and advancement of Blockchain technology around the world. This year’s challenge received 700 applications from 79 countries around the world. The judging committee shortlisted 20 entries to compete in the challenge after completing the preparation and training phase with the DFA.